Writer to Writer is a guest blog project from Girls’ Club writer in residence Jan Becker that focuses on local writers and their perceptions of how femininity and self-proliferation figure into their work. Born in Port-au-Prince, Haiti, M.J. Fièvre published her first mystery novel, Le Feu de la Vengeance, at the age of sixteen. Since then, she’s published a total of nine books in French, and a tri-lingual (French, English and Haitian Creole) children’s book. She is also a poet, memoirist, playwright, press owner (Lominy Books), translator, and college professor. 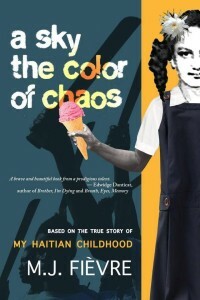 Her most recent book is A Sky the Color of Chaos (Beating Windward Press; 2015), a memoir that chronicles Fièvre’s perilous childhood during the turbulent rise and fall of Haiti’s President-Priest Jean-Bertrand Aristide. Fièvre will be one of the authors reading at the Catalogue Launch at Girls’ Club, Saturday, June 25th at 7pm. For this interview, Girls’ Club Writer in Residence, Jan Becker, talked with Fièvre about the complications of constructing a “proxy self” in memoir, what it’s like to have one’s writing transformed into visual and performance art, empowering other voices, and Bolivian salteñas. An excerpt of A Sky the Color of Chaos follows the interview. JB: M.J., you and I have had a couple of online discussions before this at The Nervous Breakdown and Sliver of Stone Magazine, and I’m excited to continue our conversation. For this interview, I want to start with the idea of “proxy self” in memoir. That is, the idea that when we look back and recreate scenes from our past, we writers are tasked with recreating a self that isn’t quite who we are right now. I know from my own writing that this can be a challenge, especially if I’m writing about a self of whom I’m not proud. In your memoir, A Sky the Color of Chaos, you write about your childhood in Haiti, and I–a reader, who is also a friend–could see there were M.J.s who are different than the M.J. I know. Did you struggle with your proxy selves as you were writing? In what ways? MJF: I never stop reinventing myself, so my proxy selves are legion. From the naïve child who loved humanity beyond reason, to the emo adolescent, to the all-Haitian girl trying to fit in at Barry University, to the woman who went to Santa Cruz de la Sierra to find herself, to the young divorcée, I’m always evolving. I’m in a constant state of deep awareness and willful unknowing, with my “truer self” always ahead of me. The possibilities feel limitless. When writing a memoir, you might be writing about the past, but your current self permeates the pages as it filters the memories and the interpretation of these memories. If this current self doesn’t stay put for more than weeks at a time, imagine the struggle. It took eight years to finish the book. Most of this time was spent rewriting: the memoir kept evolving with my self and I suffocated under the weight of all the different selves I’ve been–not sure which one to trust. So, yes, I did struggle with my proxy selves, Jan. Whatever stories you’ve been telling yourself about yourself throughout your life, these narratives get abandoned, refined, reshaped, challenged. Let’s say you’re writing about your ten-year old self. In the end, this ten-year old girl is only a reconstruction. She’s partly the self that existed when you were ten, but she’s also the sum of the perceptions of your current self and those of all the former selves who existed between the object and the subject and who, at some point, reflected on the experiences of that ten-year old self. One might wonder then: Is a memoir even authentic? Yes, because the conflicted selves are their own story. JB: Were there M.J.s you resisted developing as fully as you managed to in the final draft? MJF: While writing the memoir, I discovered that I had a lot of contempt and anger directed at some of my proxy selves. At first, I resisted these emotions. My memory became fragmented, dreamlike, partial, and blurry, as if seen through tears–which sometimes was the case. Memories were displaced, and thus, the responsibility to ever really confront these memories was also displaced. I hated my nine-year old for her vulnerability and naïveté. I hated the different teenage M.J.s, who often thought they knew it all. In the end, I had to learn to forgive all the young M.J.s who’ve inhabited this realm, and I had to accept that they’re all still part of me. JB: You’re a prolific writer, and utilize many different forms and genres. In addition to memoir, fiction, poetry and children’s literature, you’ve recently begun to have your plays performed, both in O, Miami’s Poetry Press Week, and also with the Miami Micro Theater. O, Miami even turned one of your poems into a sculpture! What is the experience like, of having your work performed or transformed into art? MJF: Last April, my poem On Charles Avenue was turned into an art installation in Coconut Grove. The knowledge that my words can create something tangible—wow! 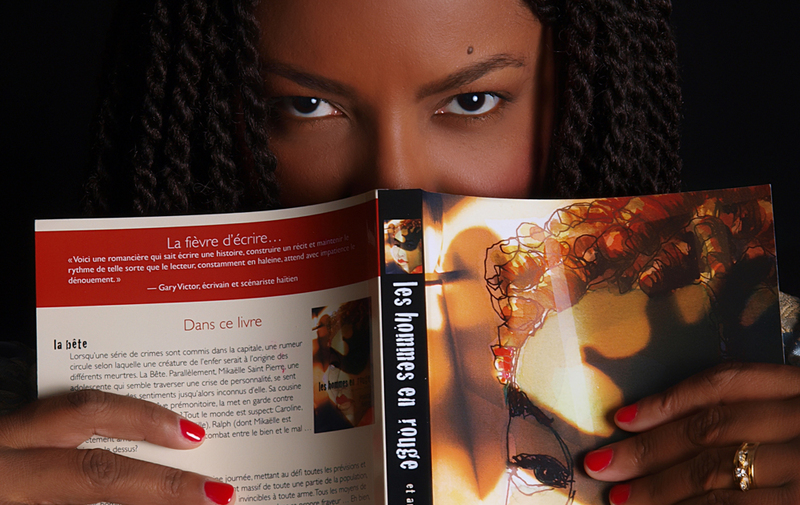 When I was 16, I self-published my first YA novel in French, Le Feu de la Vengeance. My friend Didier and I considered turning the book into a graphic novel, and his drawings constituted the first time my work was ever transformed into art. I still have the original artwork. In 2001, I signed my first book contract for another YA novel, La Statuette Maléfique. Chevelin Pierre, an artist I didn’t know at the time, illustrated the book. It was unreal to see the faces of my characters–they looked as innocent as I’d imagined them. Three years ago, Jean P. Icart-Pierre illustrated my trilingual children’s book, I am Riding (One Moore Book; 2013), about a girl learning how to ride a bike. This book is based on my own childhood, so this girl drawn on the page was me. It brought me to tears. As I wrote the informational scripts for the University of Miami, I already had specific actors in mind. In fact, I made several changes to the script to adapt to the actors’ personalities and delivery. It was still thrilling to see my words came into life, but I’d already imagined it all. To Accept, Dial 5 Now, directed by the talented Gladys Ramirez, was my first literary work to be performed at the Miami Micro Theater. I didn’t take part to the audition process, so the rehearsal was fascinating. The characters (played by Chasity Hart and Jovon Jacobs) were so much more passionate and human than I could have ever imagined. I was in awe. A year later, I turned myself into a director and co-directed Shadows of Hialeah at O, Miami’s Poetry Press Week. No surprise there, because I knew exactly how I wanted the play-in-verse to be performed. I’ll tell you what I’m looking forward to: An adaptation of Shadows of Hialeah (directed by Gladys Ramirez and Rommel Arellán) is to be performed at the Micro Theater next month for a season dedicated to LGBTIQ communities. While the original play explored heterosexual love, in No Pill for Loverhorn, both characters are male. I’m eager to see the difference in energy. I haven’t been to the rehearsal. I’m in for a completely different experience–I’m sure. JB: How is it different than sending it off to a publisher and letting the reader experience it privately? Do you find it more cathartic to be in the audience than to wait to hear back from readers? MJF: At first, I was tempted to say that the experience of writing is relatively finite: You write something, you send it off, it’s read–and that’s it. Unless an enthusiastic reader contacts you with specifics about a piece, the experience ends. But that’s not true. My own understanding of my novels, plays, etc., never ceases to be influenced by who I am at the moment, so the experience is never finite for the writer. My proxy selves have different things to say about my work – the meaning of what I wrote never stops evolving, just like I never stop evolving. I love being part of the audience. It’s easy to lose myself in a play and forget that I’m the one who wrote the script. JB: In addition to all the writing you do, you also teach, translate, run an online journal and own a publishing company, Lominy Books. All of these ventures, it seems to me, are focused on giving voice—and perhaps power—to other people’s words. I’ve heard that publishing is a tough field to break into, and that independent presses are having a rough time. Why start a publishing house? MJF: I love collaborative projects. I love short pieces. I have decent editing skills. So I thought, “Hey, I can be of service to emerging writers out there.” You’re right, Jan, it’s all about giving a voice to writers who might otherwise remain undiscovered. I’m not in it for the money (because there is no money in it). I want Lominy Books to have a certain cachet, I don’t settle: I hire quality graphic designers and expert copy editors. Production can be expensive, marketing even more so, but all the books we’ve published have been worth it. JB: What has your experience been as the head of a small publishing company? MJF: Lominy Books’s budget is limited. Sometimes we’re not sure we’re going to break even: it’s stressful: that’s our biggest challenge. That’s why we only undertake projects I sincerely believe in. Every other aspect of the experience is delightful: working one-on-one with the writer, coming up with ideas for a beautiful cover and have the talented Charlotte Howard bring it to life, talking about the book on social media, and so on. JB: What’s next for M.J. Fièvre? MJF: M.J. needs a vacation—preferably in Santa Cruz de la Sierra. I miss those Bolivian salteñas. Mornings, he closed the blinds, blocking the sun. Mother opened the same blinds, inviting light. And so it went: open, close. Inside the house I was always searching, hiding, sneaking around, trying to understand what was wrong with them, the adults. My parents didn’t touch each other like two people in love. Neither did they talk that way. They interacted like brother and sister most of the time, and I’d grown to like the fragmented way only two people with a shared history can talk. People who also like rituals—the togetherness in the brushing of teeth, the crawling beneath the sheets, the listening to the gentle night noises of insects discussing the moon. Often they just sat together on the balcony, content with each other’s presence, listening to the croak of cicadas, the held breath of the sky. Fireflies wobbled beneath the silhouette of tree branches. A mocking bird, perched on a neighbor’s roof, tweeted its many tongues. They listened to bird songs, their minds drifting and comfortable with each other’s silence. Dogs yapped. Buses stopped. Locusts clicked. The voices of neighbors enclosed their house. There was fellowship over bowls of akasan or labouyi. Camaraderie amidst the honeysuckles that unfolded, turned sweet inside, waiting to be plucked, pulled and sucked dry. The moon was full. No walls restrained the air, the darkness, and words were abandoned for other understanding. They loved each other in this silence. It was the most mysterious of loves, I understand now, years into the future. What they shared, I’ve come to believe, was a sense of peculiarity, a scaly oddness, a deep solitude—even in a room full of people. When they met, they must have thought, you are just as scared of life as I am, the realization tingling through their scalps, down their arms and legs. All this time they thought they were alone at the bottom of the fear they kept falling into, but it was not true. The skies filled with kites of all colors, shapes, and sizes, and the people of Christ-Roi gathered on rooftops and balconies to watch them. No sound on the balcony but the steadiness of breathing. My parents drew themselves, committed their souls, no longer thinking of how, just this morning, they’d been quarreling—their fights now faint and unimportant. Forgotten the slammed doors sending jolts that traveled through my gums, down my spine, bruised the pressed flesh of my knees together. When night came, they were dazed by the full moon, its half-smile anointing their reconciliation. A quiet candle outdid itself in a red glass vase. Despite their disagreements, they had an unshakable belief in their collective future. Sometimes Mother closed her eyes. He took her hand and squeezed it. Both their hands shook, and I knew what it meant: We are going to make it through this. They shared something complicated but real. Jan Becker, local writer and poet, has been selected as Girls’ Club 2015/2016 writer-in-residence. Becker will work collaboratively with Girls’ Club to present various public programs and contribute writings in conjunction with the exhibition Self-Proliferation, curated by Micaela Giovannotti. Jan Becker was born in a small coal-mining town in Northeastern Pennsylvania, and subsequently grew up in a Marine Corps family on military bases all over the United States. She completed her BA in English, Creative Writing and Rhetoric with a concentration in Global Cultures at SUNY Binghamton, where she was awarded the Andrew Bergman Prize in Creative Writing, and the Alfred Bendixen Award for her creative honors thesis. She is currently an MFA candidate at Florida International University, where she is focusing on creative nonfiction for her thesis. At FIU, she’s taught courses in composition, technical writing, creative writing and poetry. She has also taught poetry and nonfiction workshops with Reading Queer and First Draft with the Center at MDC. In 2015, she won an AWP Intro Journals Project Award for creative nonfiction. Her work has appeared in the Florida Book Review, WLRN, Emerge, Sliver of Stone, and Circus Book, among other places, and is forthcoming in the Colorado Review. She has also been a regular contributor to the online photography and writing project Selfies in Ink, and is a freelance copywriter and editor.